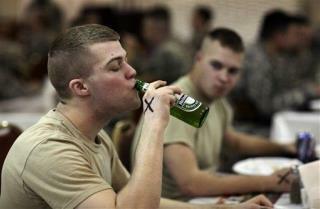 Around 20% of active-duty troops said they drank heavily in 2008 (five or more drinks per day, on a regular basis). Nearly half—47%—engaged in binge drinking in 2008 (five or more drinks per sitting for men, four or more for women, but not on a regular basis). That's up from 35% in 1998. Drug abuse is not nearly as rampant as alcohol abuse, but it is still on the rise. In 2002, just 2% said they abused prescription drugs; that rose to 11% in 2008. Like Cops their lives are in danger every second ..WHAT SHOULD BE EXPECTED? THC Pills ...Methadone? i think being killed in combat is their major health crisis.